I was first introduced to Dominion in 2011 during Thanksgiving break when I visited my old high school friends in Edison, NJ. I was instantly hooked and I found myself driving out to the nearest mall to pick up my own set. 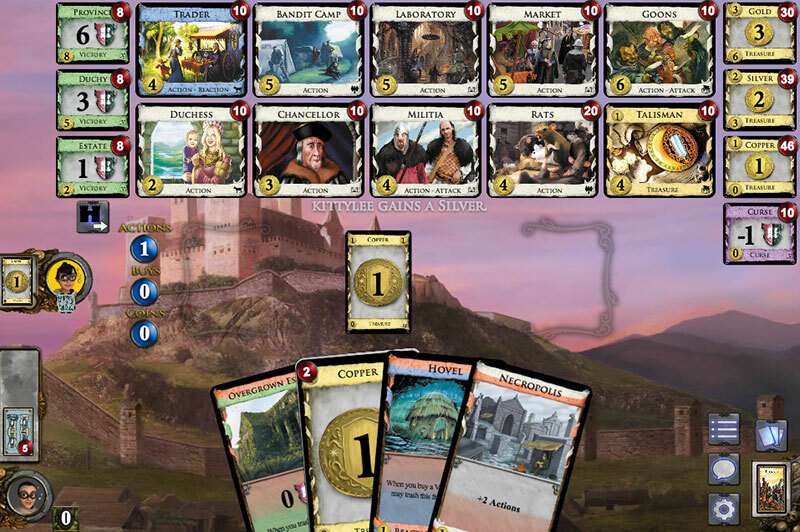 Dominion is a deck-building strategy game. You draw five cards on each turn and play with piles of supply, treasure, and victory cards. The point of the game is to build a deck that will enable you to buy the most victory points. The game ends when the most expensive victory cards run out. The game can be played with just two players or as many as six if you have the Intrigue expansion set. Isotropic was a beautifully minimal and free version of Dominion. It was incredibly fast and attracted some of the best players in the world. In the early days of playing Dominion, I bought the physical boxed sets. I would invite friends or just play one-on-one against Melanie. The downside to playing with physical cards was that it took a while to set up and clean up. The scoring and play also got a bit messy at times, especially when we got fancy with combinations. 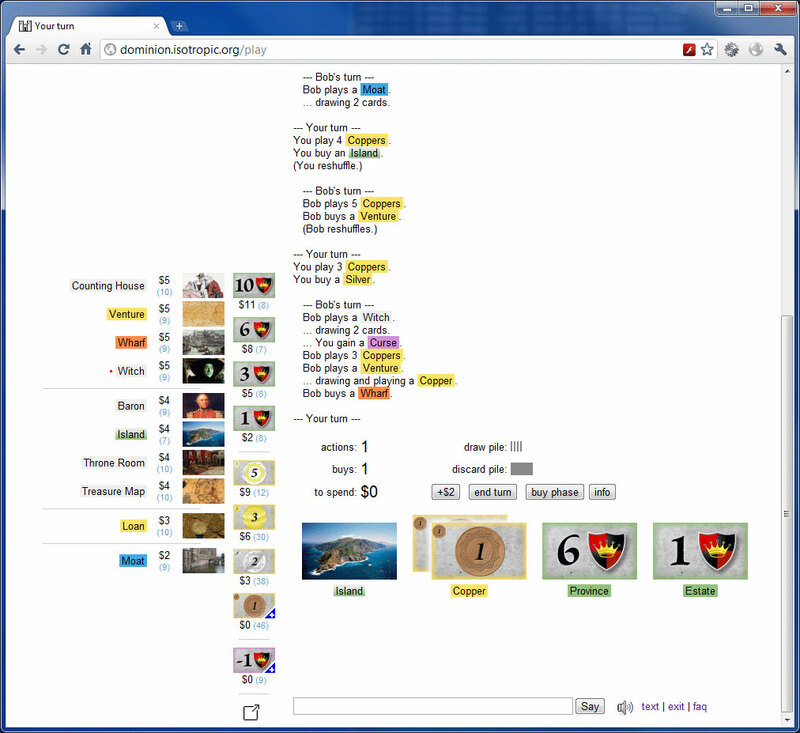 When my friends and I came across Isotropic, an online version of Dominion, we were able to play many more games in shorter amounts of time because set up and clean up for each game was instantaneous. My friends and I would meet up on weekends to play a bunch of Dominion games from morning till evening on our laptops while trash talking and drinking beers in person. Losers would pay for Dominoes pizza (we called it a Dom-Dom party). Then one day, Isotropic, which was run by a Google engineer as a side project, disappeared as the publishers of Dominion released their official game. The new interface felt over-designed and slower. It also required payment if you wanted access to all the cards. My friends and I stopped playing. There were a few moments when we tried to pick it up again, but without Isotropic, it didn’t feel the same. A few months ago, I visited my buddy Welton in Philadelphia. He was one of the friends who introduced me to Dominion. He and his wife Meredith were purists in that they only played the physical card version. I was visiting with my friend Andy, who also played Dominion. The four of us soon found ourselves immersed in a marathon session. We must have played at least 8 games. The beauty of Dominion is that if you own all the expansion sets, which Welton certainly did, you can create all kinds of combinations with supply cards, leading to endless variations in gameplay. This is probably the main reason why I don’t get tired of Dominion as easily as I would a game like Settlers of Catan or Ticket to Ride. On the way home from Philly, all Andy and I could talk about were the various combinations of cards in Dominion and how badly we wanted to play some more. We couldn’t stop nerding out. I revisited DominionStrategy.com and the Dominion Strategy Forum, a couple of sites I used to frequent when I was really into the game. Andy told me about YouTube videos of narrated games featuring elite Dominion players. I would later check some out and commit some engine possibilities to memory for future use. This is a screenshot from a game I played recently with Melanie on the official Dominion game website. When I returned, I told Melanie about all the fun I had playing Dominion again. I insisted that we try playing again on the official website. After a few games, the two of us were hooked. While I still miss Isotropic, I’ve gotten used to the new interface. Melanie and I cozy up on the couch and play next to each other with our laptops. We savor our wins with trash talking and victory dances. With the weather getting colder and our motivations to go outside waning, Dominion offers a convenient escape. We don’t play more than 3 games at a time, but that’s enough for the majority victor to feel accomplished for the rest of the day. While Mel was a bit rusty the first few weeks, she’s gotten to a point where she’ll win just a little bit less than half the games. Given her competitive nature, we’ll probably be dead even in the coming weeks. Over the years, I’ve played my fair share of board games. In addition to Settlers and Ticket to Ride, I’ve also played Puerto Rico, Agricola, Stone Age, and Carcassone. And while these have been fun, I don’t think they have the same level of game play and long-term repeat playability that Dominion has. I also love the many ways players can win. There’s an element of self-expression and creativity in how the game can be played, and I love taking chances to find ways to win in very impressive and elegant ways (albeit with limited success). If you told me fifteen years ago that I would one day be spending my Friday evenings playing a card strategy game in my living room with my wife, I would’ve been highly skeptical. I grew up a high school athlete and my entertainment primarily consisted of playing sports. I made fun of my friends who used to get together and play Magic: The Gathering every day after school. Sitting around and shuffling a bunch of cards didn’t seem appealing to me. Plus, what would the girls at school think? These days, I’m the one trying to get my friends together to sit around and play Dominion all day long. I find that Dominion satisfies some of the things that I love about sports: it’s a game that requires strategic thinking, smart timing, quick recognition of patterns, and a good read on your opponent’s intentions. These days, I limit my sports activities to avoid injury and opt instead for exercise. And when I’m feeling competitive and craving a win, I ask Melanie to meet me in Great Hall II or Laboratory II so we could get our private match going.